This spreadsheet values a company's share price by using the Free Cash Flow to Equity model. The Free Cash Flow to Equity is defined as the sum of the cash flows to the equity holders in the firm. The terminal value of the firm's equity beyond the projection horizon is also estimated and added to the cash flow. The final cash flow discounted with the cost of equity provides the equity value. 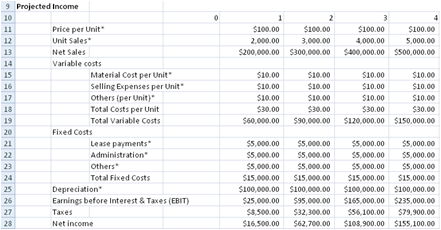 The following are inputs to be entered into the spreadsheet as assumptions. The values will be used by other parts of the spreadsheet. Cost of Equity - This is used to discount the cash flow to equity. Growth rate of Cash Flow after projection horizon - A fix growth rate after the projection horizon. This growth rate is used in the estimation of the Terminal Value of the company. Value of Non Operating Assets - The Discounted value of the Free Cash Flow to Equity yields the value of the operating assets. The equity value can be derived by adding the value of the Non Operating Assets from the value of the operating assets. Number of Common Shares - The equity value will be divided by the number of common shares to determine the price per share. The reason for multiplying the Interest with (1- Tax Rate) is because Interest can be used as a Tax Shield. The Net Working Capital and Investment (Capital Spending) are taken into account in these two sections. This section uses the value from the Net Working Capital, Investment (Capital Spending), EBIT and Depreciation to calculate the Free Cash Flow to Equity. By downloading this software from our web site, you agree to the terms of our license agreement. Copyright © 2004-2018 spreadsheetml.com. All rights reserved.